YouTube user often likes to group and classify videos to playlists by the same event, artist or just by their nature. Such as "Grammy Winners 2015" playlist, Beyouce's new album "Beyonce's world" playlist, or something like "The Most Heart Breaking Songs" playlist whatsoever. And it offers convenience for us to enjoy videos one by one in a group without one needless click. But how to download YouTube playlist with a free youtube playlist donwnloader is the question I'm here to answer today. To download YouTube video playlist and also play it one by one with a free YouTube playlist downloader, 5KPlayer is all you need. It enables you to download and play the HD or UHD video playlist without costing you a penny. 5KPlayer is a new media player to the users yet with numerous capabilities. It is more than a video music player; it also serves as an airplay streamer, and a YouTube video downloader that support downloading YouTube playlist to MP3, plus the support of downloading YouTube playlist in one shot. With 5KPlayer in hand, you can download any video playlists on YouTube by following the guidance below. 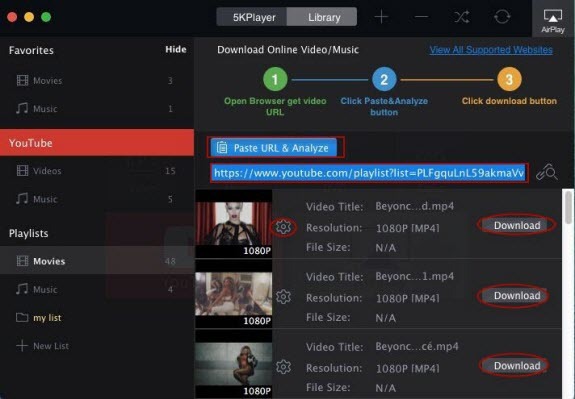 5KPlayer is a YouTube playlist downloader that is very easy to manipulate, and it also supports downloading playlist from other online video sites. Free download 5KPlayer first and follow these steps to get your YouTube playlist downloaded. Step 1: Go to Youtube, find the video playlist that you want to download. Step 2: Copy the URL of this playlist. Note: When you find the playlist on YouTube, you can only go to the right playlist page by clicking the name of the specific playlist, because if you click the image of the playlist, the appeared URL is just belong to one single video. Step 3: Run the 5KPlayer, and click "YouTube" button on the main interface. You will then jump to the YouTube playlist download window. Step 4: Click "Paste URL & Analyze". The playlist information will show up below the address bar. Step 5: Now you can press "Download" button to download YouTube videos of the whole playlist at the same time. Of course you can always skip the video that you don't want to download. Now you can sit back, get a cup of tea and enjoy watching the YouTube playlist you just downloaded. 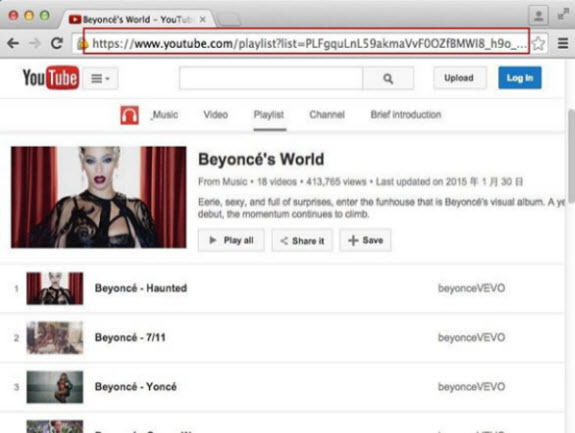 If you want to download the YouTube playlist in music format, you can learn how to download YouTube music videos in MP3. 5KPlayer also supports stream the playlist to Apple TV via AirPlay, but which means you have to convert the Videos to MP4 or other AirPlay supported formats first. 5KPlayer is available for you to choose the format and resolution of the video playlist before pressing the "Download" button, and just need to choose from the settings menu right beside the video image. The downloaded YouTube playlist will be saved in the "videos" file below "YouTube" on the left. You can add them to your favorites by click the heart icon on the video image. Best free YouTube playlist downloader for Mac (El Capitan) and Windows (10) to download YouTube playlist videos in batch. This free SoundCloud downloader can also download music from other sites like SoundCloud such as YouTube and Vevo.